It's Jack's birthday, and he's excited about turning five. Jack lives with his Ma in Room, which has a locked door and a skylight, and measures 11 feet by 11 feet. He loves watching TV, and the cartoon characters he calls friends, but he knows that nothing he sees on screen is truly real - only him, Ma and the things in Room. Until the day Ma admits that there's a world outside . . .
Told in Jack's voice, Room is the story of a mother and son whose love lets them survive the impossible. 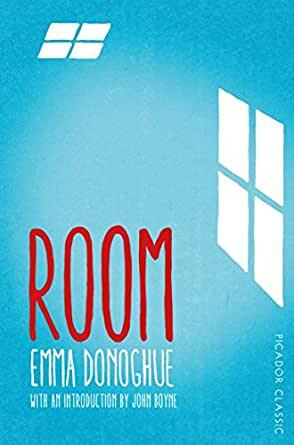 Unsentimental and sometimes funny, devastating yet uplifting, Room is a novel like no other. The story of a mother, her son, a locked room and the outside world. Shortlisted for the Man Booker Prize 2010. Soon to be a major motion picture, directed by Lenny Abrahamson. After seeing the trailer for the movie, I came home and bought the kindle version and started to read it at 9pm I have just finished it at 1:30am. I know I will not be sleeping for several hours yet because it completely has awed, humbled and depleted me. It is a book that requires intense emotional investment. That's all the warning I can give you without spoilers, so when you pick it up prepare to invest in it and to lose yourself in Jack's voice. I was apprehensive for the first few pages in wondering if I could connect to Jack and his innocent and juvenile style, he is the 5 year old narrating the story but... this worry was quickly forgotten as I was mesmerised by the story. I couldn't bear to be separated from little Jack, who is authentic, believable and loveable. This book asks us to consider absolutely everything from the point of view of a child who's never known anything but the existence into which he was born. If all you've known is 11 by 11ft room and know of none of the cruelty that your mother has suffered, or the outside world then how can you think anything is bad. I loved the fact that Jack found stairs daunting, that TV characters were real to him, that toys made from papers or eggshells were things to be cherished. What a wonderful job of creating their little world Ma did, of letting us into how Ma's imagination taught Jack, kept him safe, and kept him entertained. I had such respect for Ma as she taught Jack about so many things in a world he didn't know. Her imagination for passing the time with games using so few resources was incredible. Her love of Jack so deep and pure. As a reader you only understand the extent of evilness once they are out which actually makes the book quite uplifting and beautiful. I know I will be thinking about this book for a long time and I certainly can't wait to now see the movie. Highly, highly, highly recommended. 5.0 out of 5 starsAn interesting view on life when you are not out amongst it. A captivating story that makes you want to do something to save this young Mum and her little boy. The mother turns every tragic day into excitement for her son, with games and meals, and even exercise. She educated him with all the knowledge she had. You don't miss what you don't know, so the little guy had no idea there was anything else outside the room. When they did get out, the struggles to fit back into society really had you thinking. Such an enjoyable book. The book has a bit of a slow star, however you realise why after surpassing this. Definitely worth sticking to as it gets very intense amd captivating. A gripping read, very emotional, interesting and from a unique perspective of the maim character Jack, a five year boy. Would recommend! An incredible story, written perfectly from Jack's 5-year-old point of view. I found I could not put this book down, that I didn't want it to end! I would reread this again in a heartbeat. I found the baby dialogue in this book slightly annoying at first. It is a good read if you can get over that and persevere with it. The story is a good one, a young woman is kidnapped & held for 7 years. In this time she has a child to her kidnapper and the story is told through the child, hence the dialogue. I liked the book but wouldn't say it was a must read. A wonderful narrative beautifully told through the eyes of five year old Jack. The author's characters and their authentic conversations are very believable. Well crafted entertainment!